The STS Reference Sensors are Pt100 reference probes used as the reference instrument to verify true temperature in any type of hand-held, liquid bath, or dry-block calibrator. Use directly in custody transfer application where high accuracy means money. The superior specifications combined with a long history of reliability and low drift have made the STS probes the working standard in many national laboratories worldwide. STS sensors are economical, and offer fast response times, low immersion depths, compact physical sizes, and specified low drift rates; even at high temperatures. Combine with or temperature instruments for complete high accuracy systems. STS050 Pt100 reference probe, solid, with handle. -50 to 400°C. STS100 Pt100 reference probe, solid. -150 to 650°C. 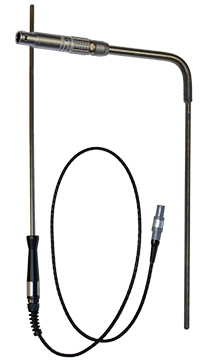 STS102 Pt100 reference probe, cable. -50 to 155°C. STS103 Pt100 reference probe, solid. -45 to 400°C.